The partnership that Boeing has long enjoyed with Italy is one that benefits both. Boeing has key customers in Italy for both its commercial and military business -- and that supports continued growth. A look back at some of the 2011 highlights around Boeing through the cameras of Boeing photographers. 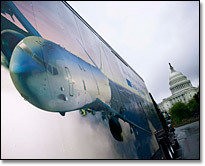 One of the efforts to commemorate the U.S. Navy’s Centennial of Flight celebration this year involved painting current aircraft in vintage colors and markings. The idea was the brainchild of a Boeing employee.